Zander was born 31st July 2010 14 days over due. Normal pregnancy 4 scans and no signs of any problems. Zander was born naturally, weighing 10lb 3 3/4oz. But when Zander was just 9 hours old we were told Zander had a loud heart murmur and we was asked to stay overnight and a midwife check on zander hourly on his temperature and saturations and breathing I had at that point no idea what saturation moniter was. That was a long and very stress full night the unknown was scary. The next morning we was seen at 9am, Zander went for a check with a dr who confirmed Zanders murmur was still there and loud and wasn't going to go away on its own. thin the next two weeks to see if the murmur had gone. We put things to back of our mind a little as Z was eating well and doing well. We got an appointment for August 19th 2010 I took Zander and his heart healthy sister Avril to rotherham general hospital where he was born for his scan I was dreading it. Zander was so good laid well. I remember well Z let off the loudest trump and the ladies commented on it. The scan seemed to tae forever then we had to go to out patients and wait to be seen by a consultant. This took forever. Then I was called into a consutants room, I could tell by his face it wasnt good news. He drew me a picture of a heart & went on to say several things about Zanders and his problems. Then said he think he has something called TOF tetralogy of fallotts. But we had to be reffered to leeds for a more in depth check with the specialists. While he tried to contact leeds, i Rang Dan (at the time my partner) & explained what I could to him from wat had sunk in from the consultant. Dan was trying to arrange a lift to hospital to be with us. The consultant managed to contact leeds and said we would be called with an appointment. They rang they next day, at 12 pm and had to get us a taxi to leeds for 2pm as all family was working. That scan seemed even longer than the previous day. Zanders consultant was Dr John gibbs an amazing dr. He confirmed Zander had TOF With a large hole and Branch pulmonary stenosis, what the heck was this i thought?!!? He went on to say that if Zander behaved and stayed well he would need Open heart surgery before his st birthday?! hat why would my tiny baby need open heart surgery?! please tell me why?! Some of the bits went over my head feeling like my world was crumbling. We was alloud home the same day, he gave us a booklet on TOF that I have read over and over since that day. For the first 5 months Zander did really well he thrived and apart from regular heart checks, appointments a sedated echo he was doing well. He was our page boy in Oct 2010 he looked fab. But he started to get blue tints to his hands lips and feet. By ec time he was completely off his bottles and food. and from Dec-April that was a downward spiral with no one listening to me. During this time Zander started having TET Spells. the first was in Feb 2011. it was awful one minute he was eating the next he was screaming then white and floppy, while I was on the phone to the ambulance he came round. His sats were low and we were admitted to RGH over night the next day Zander was put on beta blockers propananol 3 times a day to try and keep spells at bay. 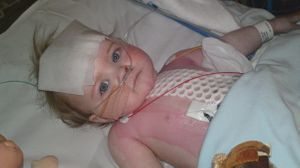 Feb 14th Zander had a heart cath at leeds done by dr john gibbs as they needed more details for Zanders surgeon. He had more spells another bad one in april 2011. Another admission to hospital his sats were low 70s late 60s. At this time we were finally reffered to a dietician. We came home the same night. Zander from dec had become more blue and more and more breathless. In April we met Zanders surgeon Mr Kevin Watterson (God). He explained Zanders heart was a very tricky condition and would be a long and very risky surgery, he said it would be sometime in the next six month his surgery. Oh my 6 months that seemed a lifetime away. But at Zanders regular cardio app in May Dr brown Zanders cardiologist decided it was time to push Zanders surgery forward hi sats were dropping he was so tired. She said she talk to his surgeon. We was told surgery would be within two weeks dr brown rang me that thurs to tell me Zander should have had surgery that day but had to be cancelled. We was rung weds 8th June dinner time by Zanders surgeons secretary Zander was due for Surgery friday 10th we had to go for admission by 2pm the next day. Was awful mixed feelings at home, what ifs etc. Also Avril not knowing what was hapening she was only just 3. Was hard leaving her with family. We got there for 2pm, was given a room, and we waited for Z's endless tests for cecking he was well enough for the next day. We went in playroom, tried to keep as normal as possible Mr Watterson came with consent forms and went over surgery plans again as said it could be 8 hours even longer. We went back to ward 10 we had been offered parents accomodation in the old nurses building so we moved our stuff over there. We walked into leeds centre in a daze. We went to the pub longest pint ever had. We sat with our phones close by at all times. We decided to go to the cinema knowing that it would be several more hours until Z was out of surgery and we had our phones on our knee the whole time. We went to see Hangover 2 but I have to say I spent more time looking at my phone than the film, we went back to parents accom and waited and waited, when it was around 8 hours we went back to ward 10 and waited in the parents room, it then got to 9 hours then 10 hours then 11 hours we was stressing thinking the worst. It was almost 12 hours I went to the nurses station they said Zander was just being taken to CICU by the time we got took to ICU it was gone 10pm and Mr watterson wanted to see us first he said surgery had been more complicated than expected and Zander was a very tough case. He had also found Z had several more layers of narrowing in his branched arteries and it was very severe. He patched up what he could get too and closed the hole. But he still had narrowings between heart & lungs and hoped they grew in time. He went on to say it was up to Zander next and the next 12 hours were crutial and he still might not make the night. We finally got to see Zander almost 15 hours later he looked so puffy but So PINK! He looked amazing in colour. But he struggled lots and those first 4 days were very up/down touch and go. He had bad temperature problems, he was on dyalisis, his heart rate was very low, he went into complete heart block, he had shadows on his lungs, enlarged liver. By day 7 he had still not got his own heart rate/rymthem back. Mr Watterson had decided Zander was going to have a perminent pacer maker implanted. a Pace maker?!! He was 10 months old!!! Mr watterson explained his surgery would last around 2 hours and they was slight risk of infection with the pm being a forgien body :(. I broke down near Zanders bed Adrien the nurse was amazing i had to know would his heart be stopped again and so much more. I rang Daniel that morning and explained everything he was already coming that day so was relieved. Daniel arrived early pm, we saw Zander for an hour. We had a call about 5pm Zander was going for surgery. We decided to go to pub and a wander, we was called at 7.30pm to let us know Zander was on the ward and surgery went well. They slowly started weaning him of the vent and other medicenes. Though he started showing signs of infection and was blue tinted for first time since surgery :(. He was put on a cousre of anti b's. Saturday 18th we saw him with his eyes open properly. It was beautiful, he moved beds and then by monday he moved into a side room. Tuesday he was moved up into HDU ward 10, he ate his 1st food in 11 days by mouth too, and Avril was with me that day and me Avril & Zander had our first cuddles since surgery was amazing!!! Love that amazing lil dude and his big brave sister!! Zander moved into his own room the next day he was getting stronger and stronger. He was allowed home sunday 26th June 16 days post surgery. He came home with 2 lots of diruetics and some other medications. He went from strength to strength crawling shortly after his 1st Birthday, his 1st birthday was very emotional. And lots of people came. Thanku all. August he had a cardio app and was taken off his diuretics. Oct 2011 we had his 2nd pacemker app with Dr blackburn. Dr blackburn found that since August Zanders inlet Valve had broken causing enlargement on the right side of his heart :'( meaning poss surgery sooner for valve replacement or repair. Oh Geeez what else does my poor lil mr have to go through?! He was put back on his Diuretics. 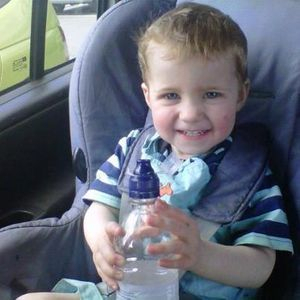 Dec we had his 3rd Pm appointment no change :'( scary to hear. Zander does get slightly breathless still and very very sweaty we are back in leeds Feb 14th I pray for improvement. We are now on July 31st Zander is 2 today, since the above update lots has happened. In January Zander started walking yes walking!!!! Finally!! Amazing, months on now he is still very wobbily but loves being on his feet. We saw his peds in Jan & his meds were upped as he was getting more sleepy & breathless. He had bloods done again. Since then we have been to leeds every 2 months, he has severe tricuspid regurgitation & enlargement of the rigt side of his heart he is on diuretics still that was upped once more in may 2012. We have had endless dietican appointments, as he refuses to eat still, he was tried 3 times with NG tube & failed. We are awaiting referreal for PEG tube.